I've been looking at beaten-down sectors for high-yield investment ideas and ended up buying this longtime dividend payer. I'm a dividend investor and love finding great companies that offer high yields. I had some cash to invest recently and started looking at Buckeye Partners, LP (NYSE:BPL) in the beaten-down midstream space. But investing is a journey. Looking at Buckeye led me to a review of CorrEnergy Infrastructure Trust, Inc. (NYSE:CORR), another pipeline stock I watch which is structured as a real estate investment trust. That led me to look at another REIT I follow, W.P. Carey Inc. (NYSE:WPC). With only so much money to invest, I chose to buy Carey. Here's why. One of my favorite places to look for dividend ideas is a list of companies that have increased dividends annually for a long period of time. Buckeye's 22 years of annual hikes puts it in rare company, and the midstream partnership always seems to catch my eye. With the yield currently over 10%, I had to do a deep dive. Investing is about balancing risk and potential reward. Image source: Getty Images. Overall, I like Buckeye's story. Simplifying things a lot, there's a great deal of uncertainty today, as the midstream partnership is struggling to generate enough cash to cover its distribution. But management is confident that a round of growth spending should resolve that issue over time. The only problem with me buying Buckeye is that it fails one of my most important tests: Would I want my family to own it if I wasn't around? For more aggressive investors, willing to watch Buckeye pretty closely, I think the partnership is a compelling investment...but that doesn't describe my wife, and I couldn't comfortably leave this asset behind for her to figure out. Buckeye's distribution concerns, however, led me to do a quick review of CorrEnergy, a REIT that invests in pipeline assets. CorrEnergy yields around 8.5% today. I've watched it for years because it offers a unique way to invest in midstream assets. That said, after oil prices plummeted in mid-2014, it was facing an existential crisis. The bankruptcy of a key tenant led to very real concerns that rent wouldn't get paid and the REIT would have to cut its dividend. I'm happy to report that it survived that test without a cut. That said, with a roughly $400 million market cap and just five material assets, it's still kind of small for most investors (including my wife), but worth a look if you don't like the LP structure. However, my review of CorrEnergy got me thinking about REITs, which have been on the outs with investors -- just like midstream companies. With REITs on my mind, I took a look at a few names I follow but don't own, including W.P. Carey. With a 21-year streak of annual dividend hikes, shares down around 20% from recent highs (at the time I was looking), and a mid-6% yield, I decided it was time to really consider this net lease REIT. The first thing to understand about Carey is the net lease structure. Essentially, Carey buys a property and then rents it out under a long-term lease that requires the lessee to pay for most operating costs (including things like maintenance and taxes). It's really something of a financial transaction, in which a company sells Carey a key property to raise cash or to free up its balance sheet. The company generally still wants to use the asset, so it happily signs a long-term lease and operates the property as if it still owned it. Carey makes money on the spread between its cost of capital (equity and debt) and the rent it charges. It was one of the first companies to focus on net lease assets and has a long history of success (note the annual dividend hikes). Generally speaking, net lease REITs tend to be relatively low risk because of the long-term nature of the contracts. For example, even during the deep 2007 to 2009 recession, Carey's occupancy levels remained in the high 90% range. Occupancy is over 99% today. In addition, with 68% of its rents tied to the consumer price index and 27% with contractually locked in rent hikes, its rent roll is also well protected from the ravages of inflation over time. Another positive for more-conservative investors who prefer to buy and hold. All in, I feel pretty comfortable with my wife owning a business like this one. The second most important thing about Carey is its diversification. Many of the largest net lease REITs are focused on retail assets. Carey's portfolio, however, is spread between industrial (29% of annualized base rent), office (25%), retail (17%), warehouse (15%), and self-storage (5%) assets. The rest is comprised of "other." It also has broad geographic diversification, with roughly 30% of its average base rent coming from developed markets in Europe. 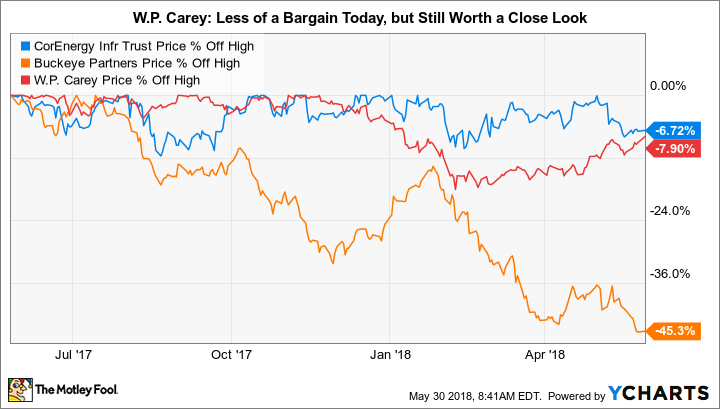 Put these two factors together and the diversification offered by Carey is unique in the REIT space. This suggests that problems in any one area of the portfolio won't derail the entire company's performance, a comforting attribute that few REITs offer to the same degree. Carey is diversified by sector and country. Image source: W.P. Carey Inc. The clear commitment to the dividend, net lease structure, and diversification were enough to make me feel comfortable with my wife owning Carey. However, what tipped the scale here is the fact that CPA 17, a non-traded REIT operated by Carey, is nearing the end of its life. It's likely that Carey will try to acquire the nearly $6 billion portfolio, just like it did with CPA 16. That purchase supported a roughly 30% dividend increase in 2013. Although dividend growth at Carey is slow today as it works on recycling capital (selling properties to fund acquisitions) in a market that isn't filled with compelling property acquisition opportunities, buying CPA 17, though smaller than CPA 16, would likely lead to a notable dividend boost. That's the catalyst that spurred my purchase of the REIT. With W.P. Carey's stock still off around 8% from its highs, this remains a compelling story for conservative investors. It is a good company that rarely goes on sale. The worst-case scenario is that Carey doesn't buy CPA 17 and you get to collect a 6% yield that's growing more slowly than hoped over time -- backed by a REIT that has boasted high occupancy levels in good markets and bad, with significant inflation protection built into most of its lease contracts, and an impressive level of diversification. That's not a bad risk/reward trade-off if you ask me.